Do you know a beauty junkie who would adore some shiny new products from some of the best high-end labels, professional salon lines, or elusive cult brands? We have a massive range of beauty products under $50 that have perfect gift potential. Mix and match their favourite cosmetics to create a personalised beauty hamper or find an all-in-one beauty set that may help them discover some fave new makeup brands. Give them a gift that will have them feeling empowered and glowing with confidence every day. It could be a gorgeous new perfume or a bold new lipstick colour they would have never thought to try. Create a spa-like experience in their own space with a luxurious fragrance, whether it’s a deliciously-scented diffuser, a sumptuous candle, or an indulgent hand cream or lotion. 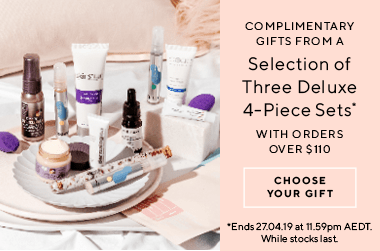 This collection of beauty gifts under $50 includes the biggest range of brands we can source, so you can get exactly what they want and love. Browse the collection online today to find a perfect present for that someone special, and pay later with Afterpay. Showing 20 products of 56. This spray is really refreshing and has a nice scent to it. I&apos;m not sure if it is worth the price though. I have tried all sorts of natural cleaning products and Bondi Wash has really impressed me...they work really nicely and smell great too. You may think the set is pricey BUT the products are well worth it and a little goes a long way. Very glad I took the plunge, now I can say I&apos;m finally happy with a natural cleaning brand!